This article is about the administrative region (Regierungsbezirk) of Bavaria. For the greater historical region of Germany, see Swabia. The county of Swabia is located in southwest Bavaria. It was annexed by Bavaria in 1803, is part of the historic region of Swabia and was formerly ruled by dukes of the Hohenstaufen dynasty. During the Nazi period, the area was separated from the rest of Bavaria to become the Gau Swabia. It was re-incorporated into Bavaria after the war. The Regierungsbezirk is subdivided into 3 regions (Planungsregionen): Allgäu, Augsburg, and Donau-Iller. Donau-Iller also includes two districts and one city of Baden-Württemberg. The Bavarian administrative region of Swabia is the eastern part of the duchy of Swabia. After the execution of the Swabian duke Conradin in Naples in 1268, his uncle, the Bavarian duke Louis inherited some of Conradin's possessions in Swabia. In 1803, with the German Mediatisation, Bavaria acquired the further East Swabian territories, which were merged with Palatinate-Neuburg. After the founding of the Kingdom of Bavaria, the state was totally reorganised and, in 1808, divided into 15 administrative districts (German: Regierungsbezirke), in Bavaria called Kreise. They were created in the fashion of the French departements, quite even in size and population, and named after their main rivers. In the following years, due to territorial changes (e. g. loss of Tyrol, addition of the Palatinate), the number of districts was reduced to 8. The Swabian territories were merged with Palatinate-Neuburg and the new district was called Oberdonaukreis (Upper Danube District). In 1837, king Ludwig I of Bavaria renamed all the districts after historical territorial names and tribes of the area. This also involved some border changes or territorial swaps. Thus the name Oberdonaukreis changed to Swabia. In 1945, the town of Lindau was divested by France, but reunited with the district of Swabia in 1955. 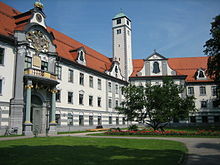 In 1972, the former Swabian city Neuburg an der Donau was reunited with the district of Upper Bavaria. Next to the capital Augsburg and several other old cities including Donauwörth, Nördlingen, Memmingen, Mindelheim, Kaufbeuren and Kempten, the Ottobeuren Abbey and the scenic attractions of the River Danube in the north and the Allgäu in the south with the Allgäu Alps and Oberstdorf and the royal castles of Hohenschwangau and Neuschwanstein next to Füssen belong to the major attractions. With the district of Lindau, Bavarian Swabia has access to Lake Constance. Swabian cuisine is down-to-earth and rather simple. Noodle products are very important.